The agricultural production is one of the leading sectors of the economic complex of Mongolia. Two branches are traditionally presented in the structure of the gross agricultural production; they are livestock husbandry and crop production. A specific feature of Mongolia is the predominance of livestock products and reliance on the pasture management system. On a national scale, the agriculture of the Baikal region of the Russian Federation holds a modest place: less than 1% of agricultural production. In the East Siberian economic region Irkutsk oblast ranks second in the production of agricultural products after Krasnoyarsk krai; the Republic of Buryatia and Zabaikalsky krai rank third and fourth, respectively. Among the regions, included into the Siberian Federal District, Irkutsk oblast, the Republic of Buryatia, and Zabaikalsky krai rank 5th, 8th and 9thin the agricultural production, respectively. In the economy of Irkutsk oblast the agriculture plays a minor role. Its aim is to meet the needs of the local population in agricultural products. In Zabaikalsky krai and the Republic of Buryatia the agriculture is one of the leading production branches, which plays a key role in the livelihood of the population. The branch accounts for about 8.1% of the gross regional product in Irkutsk oblast, 12% - in Zabaikalsky krai, and 11.5% - in the Republic of Buryatia. The agriculture develops under extreme environmental conditions: the agricultural territory belongs mainly to an area of ​​low biological activity, andits significant part is characterized by cold climate. Bioclimatic potential of the agricultural zone is 2-2.5 times lower than in the European agricultural zone. Consequently, to get a unit of agricultural production in the region requires more energy expenditures. The agriculture of regions within the Lake Baikal basin includes two major branches, namely: livestock hus band dry and crop production, the shares of which in the gross agricultural output vary regionally: in Irkutsk oblast they are approximately equal; in Zabaikalsky krai, the Republic of Buryatia and Mongolia the leading branch of agriculture is livestock husbandry, the proportion of which is over 70%. Areas of agricultural lands, which are in use by commercial farm units, engaged in the agricultural production, decrease year by year. Disposal of agricultural lands from agriculture is registered in almost all districts of the region. The main reason for the reduction of lands dedicated to agricultural production is the termination of activities of enterprises and organizations, and peasant farms. Another reason is the expiration of the agricultural tenancy (or temporary use) and its non-renewal by agricultural producers. About 1% of agricultural lands of Russia are located within the Baikal region. The main agricultural lands are located in the forest-steppe areas and along river valleys. However, the provision of the population with agricultural lands per capita is sufficient, for example, in Irkutsk oblastit amounts to 1.1 ha, and in Zabaikalsky krai it is 6 ha (average provision index for Russia is 1.5 ha). In the total area of agricultural lands of Irkutsk oblast the share of arable lands accounts for 69%, the proportion of pastures is 20%, and meadows and hayfields cover 10%. In Zabaikalsky krai the largest areas are occupied by forage lands, meadows and hayfields, the proportion of which exceeds 80%. In the structure of agricultural lands of the Republic of Buryatia the share of arable lands is 30%. Sown lands are used mainly for cereal crops (more than 75%), among which wheat occupies more than 45%. The yield of cereals on the average is low (8-9 centners per ha), but in some farms it can reach up to 20 and more centners per ha. Potatoes and vegetables are widely cultivated for one’s own needs. Sown lands under these crops amount to slightly more than 8%, of them under vegetables is 1.0%. Vegetable production is concentrated mainly around cities and settlements. 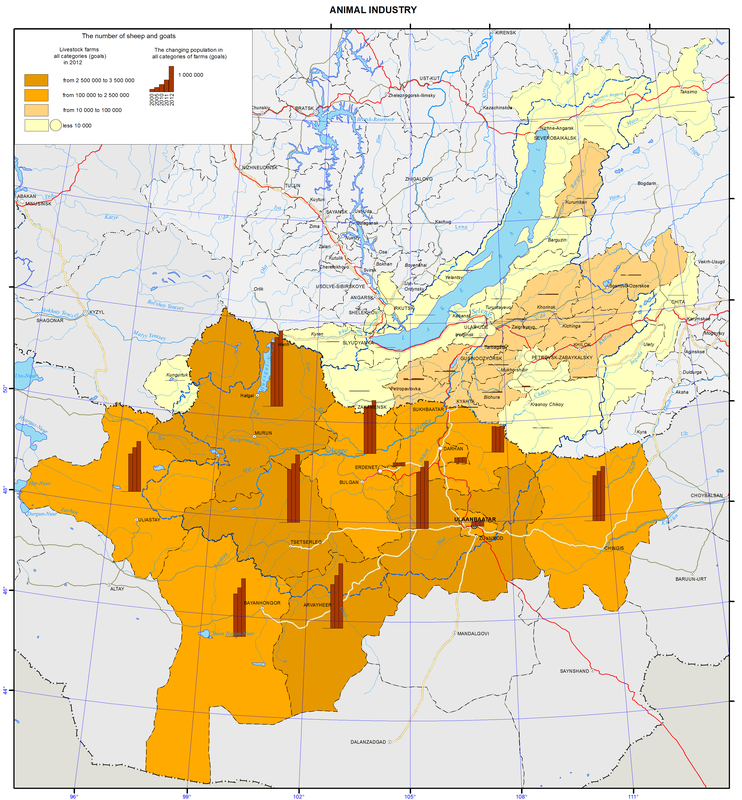 In Irkutsk oblast in the Baikal natural territory lands of four districts, namely, Irkutsky, Shelekhovsky, Slyudyansky and Olkhonsky, are involved into the agricultural exploitation. Furthermore, two districts –Olkhonsky and Irkutsky – are typically “agricultural”, where agriculture is one of the leading sectors of the economic complex. In contrast to the Irkutsky and Olkhonsky districts, in the Sludyansky district the scarcity of land resources does not allow to develop agricultural production, but the district has formed a high-intensity horticultural sector with commercial cultivation of strawberries. Currently, this resource is not included in the turnover of the legal economy of the district; it is not processed on a commercial scale, and it is realized by private buyers, who do not pay taxes. Processing of local horticultural resources is included in the plan of the production diversification in the town of Baikalsk within the framework of the program of the Baikalsk Pulp and Paper Mill conversion. In Mongolia, the total sown areas of ​​cereal crops and potatoes amount to 283.6 thousand ha and 13.6 thousand ha, respectively. Currently, the leaders in the production of cereals and potatoes are the Selenge and Bulgan aimaks. In the structure of the gross agricultural output a quintessential role belongs to the livestock husbandry. The development of the livestock husbandry, especially sheep and beef cattle breeding, is facilitated by the presence of large areas of dry grazing lands, where valuable forage herbs grow, and by a thin snow cover in winter, enabling year-round cattle grazing along with relatively small quantities of fodder procured for winter. In the structure of the fodder base for all species the proportion of natural coarse and green forage accounts for 75 to 85% of all fodder. The foundation stock of farm animals is managed in the private sector. The livestock husbandry is represented by various branches; in the forest area of the region it is dairy-meat farming, and in the south, including Mongolia, it is distant-pasture beef-dairy and beef cattle breeding, meat-wool sheep breeding, and horse and pig husbandry. Moreover, goat breeding is traditionally represented in the aimaks of Mongolia, and camel husbandry is an auxiliary branch. Most farms produce milk and beef, implementing the so-called full cycle of a herd based on internal specialization of farms, producing milk and breeding young-stock.